Vitamins, minerals and trace elements are vital for optimal metabolic function, growth, development and biological reactions. Vitamin D: is an essential micro-nutrient, it is required for a number of biological functions in the body including the maintenance of a healthy skeletal system, optimum immune function and calcium absorption. Vitamin D: is a fat soluble vitamin that is found in a limited number of foods in the human diet. Vitamin D can be synthesised withing the body by exposure of skin to sun rays. However, during the winter months when we have less exposure to sunlight, thus the intake of foods containing Vitamin D becomes more important. 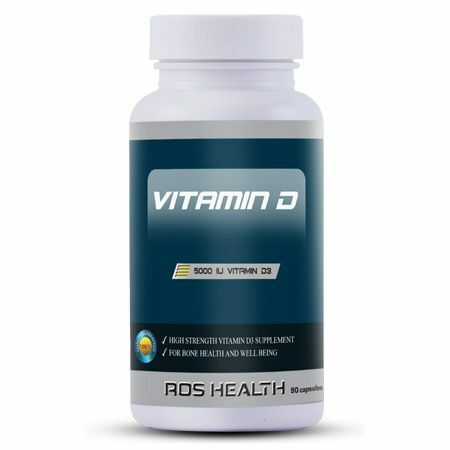 Your daily requirement for Vitamin D can be obtained from a Vitamin D supplement. EU RDA = European Recommended Daily Allowance. Ingredients: Cholecalciferol, Olive oil, gelatin (capsule shell), glycerol. Take one capsule daily with water.